It's not that I'm jealous that the team at Sterling Cooper Draper Pryce get to drink all day on the job. It's the quality of the booze. Mad Men Cocktail Guide app to the rescue? Well... sort of. If you're a Mad Men completist, hey, it's a free app with some fun features! If you couldn't care less whether Peggy finds love in the arms of a lady photog or wonder whatever happened to Kinsey, well, you might want to pass. What's good? Recipes for 21 drinks that your parents got tipsy off of in college. Interactive touches—shake the phone to shake the mixer, tilt the phone to pour your potables—that give the app some game-like qualities. And of course, that Mad Men sensibility that's already taken over my DVR. What could be better? 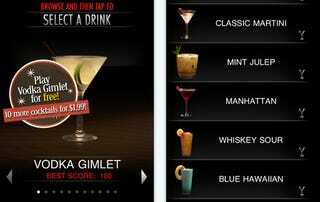 In addition to the cocktail guide, the app includes a game where you can mix drinks on your phone. It's a fun little minigame—I particularly enjoyed pinching the lime to squeeze juice my tumbler—but you only get to make a Gimlet for free. To play the other 10 levels, you need to pony up an additional two bucks. It's just not worth it, especially for an app that's basically an extended advertisement in the first place.